Make the most of your desktop workspace with this Adjustable File Rack that expands and contracts depending on your needs. When fully collapsed, our file rack can save up to 64% of your desk space. And unlike regular desktop file racks, the slots on this rack adapt to fit different size files. Also, each slot has a flat bottom to keep folders from falling through and the step style lets you keep important files visible and easy to access. With this innovative file rack you can save space and keep your desktop clear of clutter. Desktop File Folder Sorter Type: Expandable; Number of Compartments: 5; Material(s): Plastic; Width: 8". 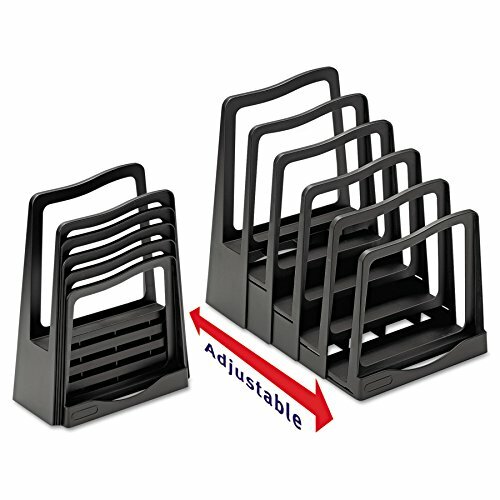 Step-style rack has five slots to keep important files visible and convenient to access. Flat bottom shelf prevents files from falling out of the rack.